I hope your week is going well. Mark and I were lucky enough to have grandkids spend the night last weekend. It's always so much fun. Saturday for lunch, we extended the birthday celebration pf their daddy, Aaron, and made a birthday cake that looked like tacos. I certainly can't recommend it as a culinary delight when it came to eating, although the "shell" was pretty tasty. The taco fixings included hamburger (chocolate covered raisins), lettuce (cornflakes covered with green-tinted vanilla frosting, tomatoes (chopped Swedish Fish) and cheddar cheese (sliced circus peanuts), with some dollops of sour cream (canned whipped cream). But I think Daddy was pretty happy that the chefs went to all the effort to make him a cake. Have you seen these small appliances at your local Target yet? They are by designer Jackie Shapiro. I have some of her French Bull fabric and love it. I'm trying to figure out how to speed up the demise of my crockpot, toaster and coffee pot...so I can justify having these in my kitchen. I really think they belong in my house. I mean, seriously, "live vivid" is SO close to "live a colorful life," right? If nothing else, they are great quilt inspiration. When Mark and I were at sample spree during quilt market, Corey had asked if we could be on the lookout for the new Bonnie and Camille fabric. I was so happy when I was able to grab a fat quarter stack for her. But I never expected to receive this in the mail! It's a beautifully quilted journal cover.Thanks, Corey--it's a treasure! And I don't think I have mentioned that when I was staying at Mark's brother's house in St. Paul last month, his oldest daughter was visiting from Japan, where she teaches ESL classes. She and her husband had brought along a stack of Japanese obis. Apparently several of them are quite valuable, but they were selling for pennies on the dollar in Japan so she brought them along as gifts. She had enough that I even got to choose one. The brightly colored silk ones were beautiful, but I bypassed all of them and chose this one instead. She said her mother-in-law had told her this one was quite valuable, which kind of surprised me because the others were so bright with intricate designs that seemed more Japanese, and this had a more geometric "modern" feel to it. She said we could do whatever we wanted with the obi, even cutting them up. After I mentioned that this would make a great bag or zippered pouches, she thought that would be an ideal use. I flipped over part of it so you could see all the silk threads that go into making the design.Just out of curiosity, would it bother you to cut this up into pieces and "upcycle" it into something else? And last, but not least, and without a doubt my favorite pictures this week...we always take family pictures in our back yard in May. This year my cousin's daughter-in-law, Shannon, took them (Shannon and Travis are the ones taking pictures each day in their wedding clothes for the first year of their marriage). Wow. We will never go back to tripod/timer pictures again! I wish I could share all 97 of them with you--they are all fabulous, but I'll just share a dozen or so a couple. Love the photo lf the family at Periwinkle Cottage! About the Target appliances, fabulous Modern look which you could duplicate with quilted covers for your current models. Fun way to add color to your kitchen and enjoy some creative sewing as well. Wow--I think I might need to take a hammer after my crockpot!--The french bull one is fabulous--I'm sure food tastes better cooked in that little lovely also! =p So glad you like the journal--It was so much fun to make for you! well, I saw on someone's blog that those harvest gold and avocado green kitchen appliances are now in the Smithsonian, so maybe you could donate your old appliances to a local museum and justify buying new ones. Also, I would cut up that obi into other stuff. once you've made the first cut, you won't look back. The taco cake is just fabulous! Very clever. Your journal is beautiful. Love the fabrics. The pictures are wonderful. I can see why you would avoid the tripod from now on. Well Cindy, you have done it again! Your family shots are priceless. 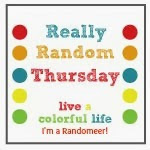 I do enjoy your random Thursdays! That cake looks, err, interesting! Love those family pics; and the cake looked brilliant! Interested in seeing what you do with the obi exactly. How cool! All of the pics are priceless!! So beautiful! Great week and fantastic photos! the pics of your family are gorgeous, and as if I am not busy enough now I am totally addicted to the blog of the photographers- wow what an adventure they are on, and it doesn't help that I started reading backward.... so many questions I have- and so little time to figure all this out! hmph. Thanks for the fun pics and though I don't know if I would be as excited to eat the taco cake as I would have been to make it, it sure looked like great fun! Thank you for the linky party!! I LOVE that you LOVE color! 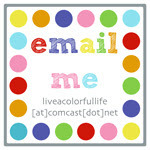 Know I added your Linky button to my list of link-up blogs that host. I just love your family photos, Cindy! Great post!! Love those home appliances! Cool! The family photos are wonderful! Can't get over those family photos! Gorgeous! I will be cutting up mine, and it is also quite valuable. If you saw it, I was given the golden/creamy obi. I was thinking of decorative couch pillows. Cut away. Otherwise it will sit folded up in a box, somewhere. Like another of her gifts to me. Perhaps I could combine the two . . . .
Those appliances are cool - looks like my charming chevrons quilt! !